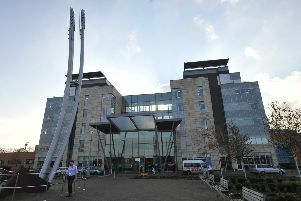 A new clinical trial is open at Peterborough City Hospital which offers treatment hope for advanced pancreatic cancer patients. The new HALO 301 trial could offer patients with pancreatic cancer that has spread outside the pancreas a potential new treatment option for a disease which currently has very few treatments. The trial at the hospital in Bretton will test patients to see if they have a high level of hyaluronan (HA), a substance which helps the pancreatic cancer tumour to grow. Patients who have a high level of HA will then be treated with two existing chemotherapies (one of which is not available on the NHS in the UK) in combination with a new treatment called PEGPH20. This is an enzyme which breaks down HA and could slow the tumour growth, ultimately allowing patients to live for longer. This treatment has already been shown in a previous clinical trial to slow down tumour growth and improve outcomes for patients with high levels of HA. The HALO 301 trial is an international trial which is taking place in multiple locations across the UK. Dr Karen McAdam is the principal investigator at Peterborough and has recruited the first UK patient into the trial. She said: “I am delighted to be part of this innovative new trial in a disease area which has historically been neglected in terms of research and investment, and joining Pancreatic Cancer UK in spreading the word about it to patients in Peterborough. “We hope it leads to not only a much-needed new treatment option for eligible patients with advanced disease, but also ultimately helps to improve survival rates and quality of life for many patients across the UK in the future. Anna Jewell, director of operations at Pancreatic Cancer UK, said: “Clinical trials for pancreatic cancer are always exciting, as new treatment options are urgently needed to allow patients to spend more precious time with their families, and this one shows real promise. “We are encouraging patients with advanced pancreatic cancer in Peterborough to find out whether the HALO trial might be an option for them from their consultant, or by calling one of our nurses on our Support Line. “Patients and families can find out more about this and other clinical trials which may be available at Peterborough City Hospital and the surrounding area by looking at our online Trial Finder. “They can also talk to our nurses to find out more about taking part in a trial and whether it would be right for them. In 2016 around 60 patients were diagnosed with pancreatic cancer at Peterborough City Hospital. If you would like to find out how you can get involved with research at Peterborough City Hospital contact Research and Development via email at R&D.Department@pbh-tr.nhs.uk.